Mark and Paul Engler's 'This Is an Uprising' proposes a craft that makes the best of both mass protest and community/labor organizing traditions. This was the late 1960s and most of our students were drawn from front-line communities where the struggles were hot. The students were famously direct and critical, and by the time Alinsky turned up they would have read his “Rules for Radicals” and been eager to take him on. The two great traditions — mass protest and community/labor organizing — continue to argue with each other to this day. 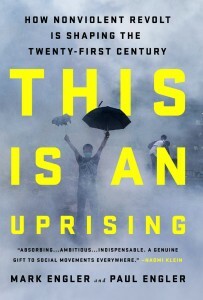 In “This Is An Uprising” Mark and Paul Engler take up the argument. Their book describes some of the foremost adversaries including Alinsky himself and activist-sociologist Frances Fox Piven and sets out their ideas fairly. The Englers’ book, however, could not have been written in the 1960s when Alinsky took on my students. Brothers Mark and Paul Engler shine much more light than we had available then. They draw ideas from the accelerating use of nonviolent struggle on local and national levels and the research that points out what did and didn’t work to produce lasting change that affects people’s lives. Spoiler alert: The Englers end up proposing a craft that makes the best of both traditions — a craft they call “momentum.” They don’t pull this off by synthesis. They do it by calling everyone to a higher order of strategizing. Born teachers, they show rather than tell. They show how momentum can work by sharing vivid glimpses from movements and campaigns as various as the DREAMers, Occupy Wall Street, ACT-UP, the Birmingham civil rights campaign, the Harvard 2001 student sit-in for a liveable wage, the LGBT movement, Tahrir Square and the campaign against Egypt’s dictatorship, the overthrow of Serbia’s dictator Slobodan Milosevic, and others. I’ve rarely seen movements described so intimately at their strategic turning points, supported with the comparative insights of scholars in the field. Reading the gripping stories alone makes the book worthwhile. They take the time to deconstruct the two traditions and show how the differences reveal strengths and weaknesses on both their parts. In the light of this book, Alinsky and my students were both right, and both wrong. Each side needed a creative leap to find ways of retaining their own strengths and borrowing the strengths of the other’s, through a new theory and practice. The craft does mean letting go of some assumptions held by both sides, and the Englers are frank about that — again backing themselves up with movements’ own experiences. As I read, I imagined going through the wealth of campaigns in the Global Nonviolent Action Database to see more examples of people practicing aspects of the craft – or not. An example of a questioned assumption from the mass protest tradition is: Disruption has the inevitable cost of getting backlash not only from the power holders but also the people caught in the middle. I remember surging with others into a center city street at the height of traffic on a Friday afternoon, for example, and shrugging off the cost to the jammed up drivers who couldn’t pick up their kids from school. The book points out that the political cost of disruption to the 99 percent can be offset by tactical choices in which the activists “put more skin in the game” through personal sacrifice. What I get from this is that creativity matters: It’s time to drop the mindless reflex of blocking traffic to show we’re indignant. Another dubious assumption from the mass protest tradition is that sheer numbers win the day. I remember during the anti-Vietnam war movement there were repeated marches down New York’s 5th Avenue. The organizers rejoiced each time the number grew, but the Englers point out — based on what actually works in getting change — drama often trumps numbers. I contrast what I call the “numbers obsession” with Alice Paul’s choice to leave the woman suffrage organization’s mass marches and start a campaign with smaller numbers and bigger drama — and then win. Right there we can see why mass protest worries some leaders of community organizations and unions – the loss of control. What those leaders miss is the opportunity for organizing that a whirlwind gives. The Englers recall Mine Workers union leader John L. Lewis’ use of a whirlwind in the 1930s to organize more unions (membership organizations) and build the Congress of Industrial Organizations into a cohesive national force that gravely worried the 1 percent. Some Occupy Wall Street leaders saw that kind of opportunity in the Occupy whirlwind, but as we know the prevailing culture of Occupy prevented building a mass movement. Now I wonder if Occupy’s resisters of growth might have been willing to play a bigger game if they had known about the craft of momentum-driven organizing. In any case, now there’s a new marker for us to go by in the Englers’ book, and new reason for hope for effective outcomes of our work.